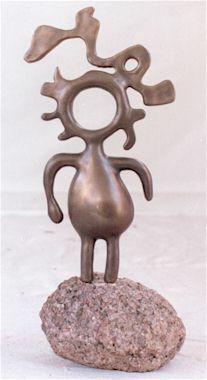 1985 Bronze casting – My paintings and sculptures are inspired by North American Indian rock art (pictographs & petroglyphs), usually of pre-white contact origin. This work has developed from a life long personal admiration and fascination toward Native American culture and religion.This is a very pure art form and reflects the Native Americans’ oneness with nature. Exploring this art form in a contemporary manner is my way to approach the culture as it was.